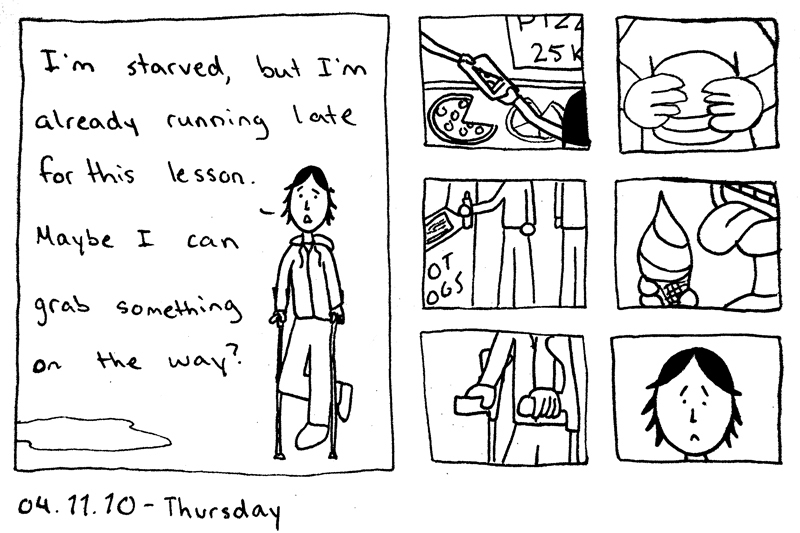 A journal comic by an American living in Prague. Sorry for the delay again. I need to get in the habit of remembering to schedule these in advance. So it turns out crutches are annoying for a wide variety of reasons, one of which is that you can't use your hands for anything, like holding food or eating food or carrying food so you can eat it later. Food. Yeah, I did that a few times to get things around, but I was late and needed to eat something on the way, which was impossible. Also, all the fast food around me was stuff you had to hold on to, no bags available. Anyway I'm off crutches now. Yay! © 2010 - 2018 Megan LeBoeuf. All rights reserved.